Pendientes colgantes de hojas tropicales en colores verde y blanco, regalo perfecto para una amante de la naturaleza. Esmalte pintado a mano sobre vidrio y montado con ganchos de plata de ley 925. Pendientes para las que buscan las joyas originales. Estos bonitos pendientes de hoja verde iluminarán un día gris cualquiera. Siéntete única con estos pendientes de temática botánica. Adecuado para mujeres con piel sensible, montado en ganchos de alambre de plata de ley. La pieza de vidrio ha sido pintada a mano con es,maltes de alta temperatura fusionada para formar una pieza sólida de vidrio. El esmalte es permanente e impermeable. 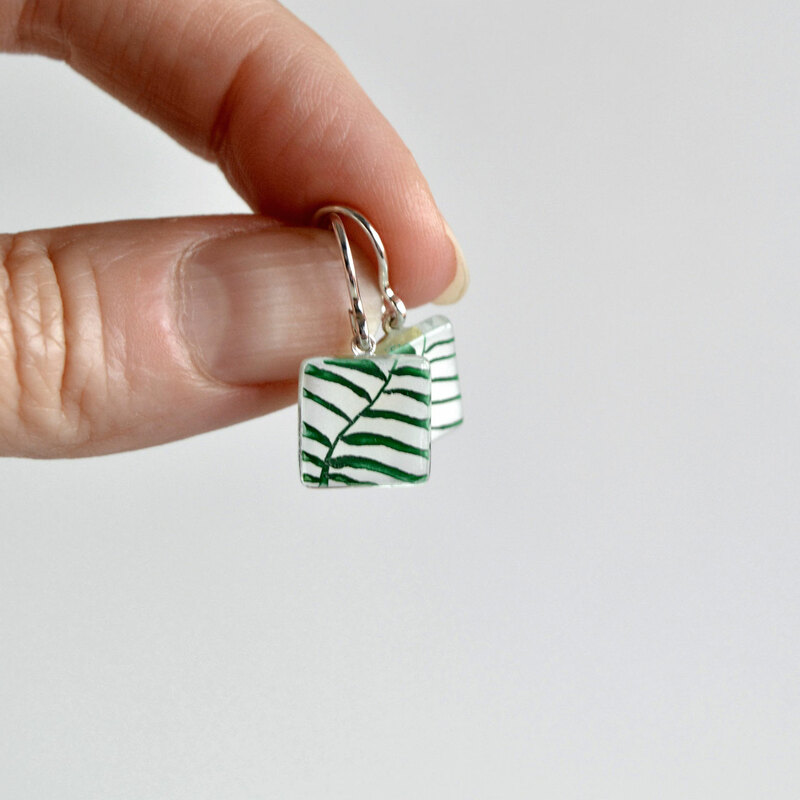 Tropical leaf dangle earrings in green and white colors, perfect gift for a nature lover. Hand painted enamel on glass and mounted with sterling silver ear hooks. Earrings for those who seek the original and unusual jewelry. 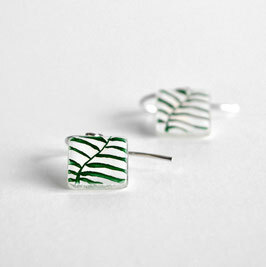 These cute and tiny green leaf earrings will brighten up any everyday outfit. 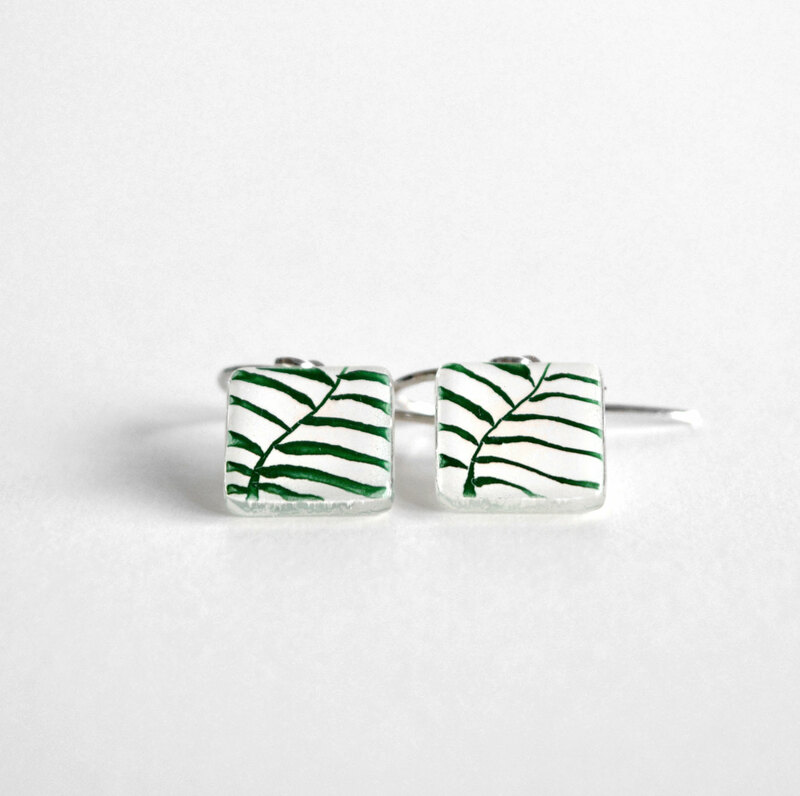 Feel unique with these one of a kind botanical themed earrings. Perfect for a woman who loves to show her own individuality. For those who are not afraid to be a little different. Suitable for women with sensitive skin, mounted on solid sterling silver wire hooks. The glass piece has been hand painted with high temperature enamels fused together to form a solid piece of glass. No fading of color, the enamel is permanent and water proof.